As Christmas approaches, widowed Reverend Caleb Brennan needs a wife, or his vengeful father-in-law will take his young daughters. When his mail-order bride jilts him, Caleb grows desperate. During a storm, he finds an unconscious boy outside his home with signs of foul play. Despite his previous misfortune, obligation compels Caleb to lug the stranger inside. But as he provides first aid, he discovers more than he expected. Bounty hunter Grace Blackwell refuses to owe a debt to any man, especially one as charming as Reverend Brennan. 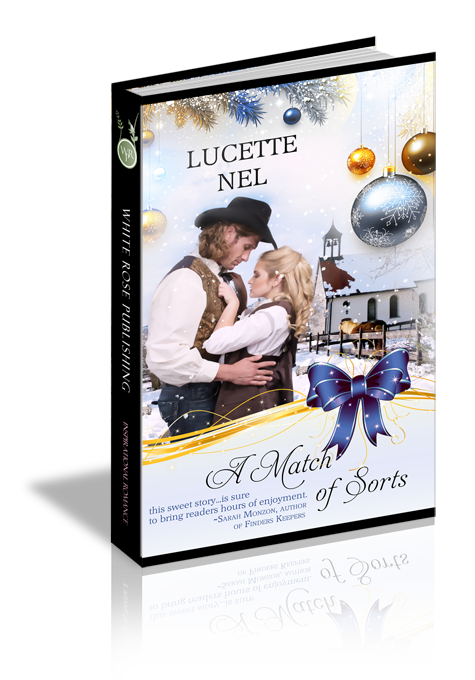 To repay him for saving her life, Grace agrees to pose as his mail-order bride. If their ploy is discovered, Caleb could lose his daughters. But in their pretense, the reverend and the bounty hunter might just both lose their hearts. “You’re loco. You know I can’t marry Miss Preston.” The seamstress might be the prettiest woman in town, but she was too young and too idealistic. His second marriage wouldn’t be one of love and companionship, and his bride needed to understand and agree with the terms from the start. He’d experienced love once before. Almost from the moment he’d first laid eyes on Margaret, he’d loved her. And she’d returned his affections. Her death near destroyed him. Never again. His next union would be one of respect and remoteness. An alliance on paper suited him. “Whoa. You expect the entire town to go along with it?” Caleb braced his elbows on the desk. “Will you throw those who refuse to play along in jail?” A rustle from the bunk drew Caleb's gaze. The comatose drunk had rolled over, but audible snores still floated from the cell. “I’d rather not.” Caleb downed the last of his coffee. After putting so much effort into convincing his daughters how nice it would be to have Mrs. Haddon around, he now needed to tell them their plans had changed. He massaged his hip. The wound had healed, but the constant pain and distinct limp remained despite the doctor’s predictions that it would disappear. “That’s your suggestion? To wait?” Caleb leaned forward and swiped Luke’s feet from the edge of the table just as his brother crossed his ankles. Few things were more amusing than watching a grown man flailing his arms like a baby bird. Luke managed to keep the chair from tilting, regained his balance, and then landed the chair on all fours on the floor with a thud. Caleb stood, clutched his cane, and moved to the single window. Puddles dotted Church Street. A lone wagon jumbled toward the general store, the rider hunched against the wet weather. Working his jaw, Caleb leaned his shoulder against the frame. Frosty air seeped through the cracks around the window, and he pressed his forehead against the cold pane. “I don’t know.” Last thing he wanted was to be forced into a marriage. But when Reverend Conrad’s terms for Caleb to find a mother for the girls remained consistent, Caleb turned to the mail-order bride catalogue. His father-in-law might be a minister, but many of his friends held prominent positions: judges, lawyers, and lawmen regularly dined at Reverend Conrad’s table, and Reverend Conrad held Caleb accountable for the death of Margaret. Caleb slumped against the wall and folded his arms. There were no answers to be found in the rafters, but he preferred the view to Luke’s face. His father-in-law was bound to arrive in a couple of days. Caleb planned to be married to Mrs. Haddon by the time the man climbed off the stage. Mrs. Haddon had shown a similar interest, which was why she’d agreed to marry him. From their first written correspondence, she’d sounded like the perfect candidate. She was educated and a widow. Exactly what Caleb needed for Abby and Libby. I need wisdom, Lord. And help.